The popular Natural Smile EastMed Dental, available at 09 585 0205, is offering unique pain free dentistry treatments to patients in St. Heliers and Auckland. The popular Natural Smile EastMed Dental has expanded the range of pain free dentistry services it can offer those in St. Heliers and nearby areas in Auckland who want a great looking smile with less stress and discomfort. More information is available at https://naturalsmile.nz. 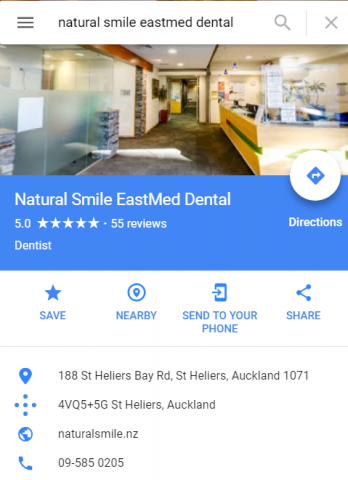 The Natural Smile EastMed Dental is an award winning dental practice with more than 25 years of experience providing the people of St. Heliers and Auckland the very best in cosmetic and general dentistry. To keep adding to the quality of service that has earned them more than fifty five star reviews on Google, the practice has once again expanded the range of pain free dentistry solutions it can offer. These now include state of the art biomimetic dentistry and air abrasion technology that can remove tooth decay with no pain, damage or noise and allow for fillings that look better, feel comfier and last a lot longer. They include the famous CEREC system which can provide personalized ceramic crown restorations in just one visit and with no uncomfortable impression trays or temporary crowns. And they include a wide variety of other 3D imagery and minimally invasive techniques that can make everything from simple preventative treatments to more complex procedures like root canals really precise and pain free. All of these treatments are also paired with the gentle touch the owner and seasoned dentist Dr. Dave Richards is known for and the friendly, personalized service that has earned the clinic its 50+ reviews on Google and a long standing reputation as the ‘go to’ dentist in Auckland. To book an appointment at the Natural Smile EastMed Dental and find out more about all the pain free dentistry options they have available, the public can call 09 585 0205, visit them on 188 St. Heliers Bay Rd., or check their website at the link provided above.